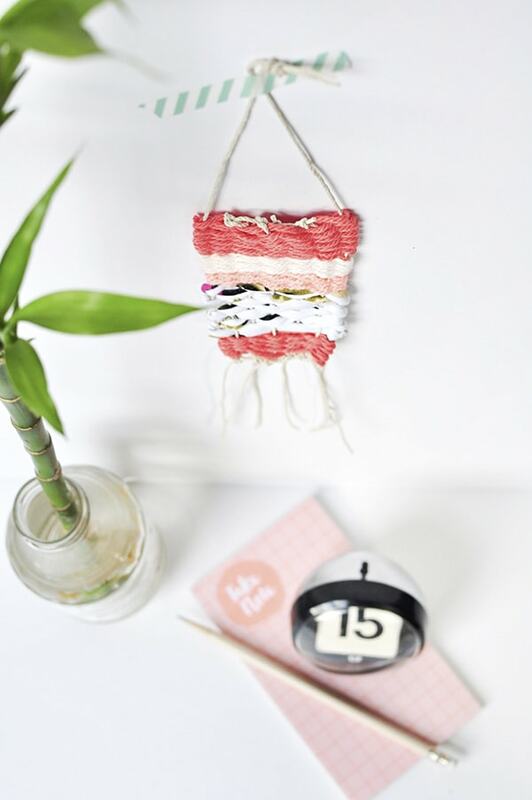 INSIDE : Learn how to make a Mini Wall Weaving DIY using a few pieces of yarn, a simple step by step tutorial and before you know it, you’re left with a lovely boho wall weaving. I have had my eye on creating a Wall Weaving for quite some time. In fact, just about this time last year, I shared a The Best of Wall Hangings post where I rounded up my favorite ones. However for some reason, I was too intimidated to give them a try myself. Maybe it was how complex they looked or how long it would take me to create a decent sized hanging. But I decided to just TRY. 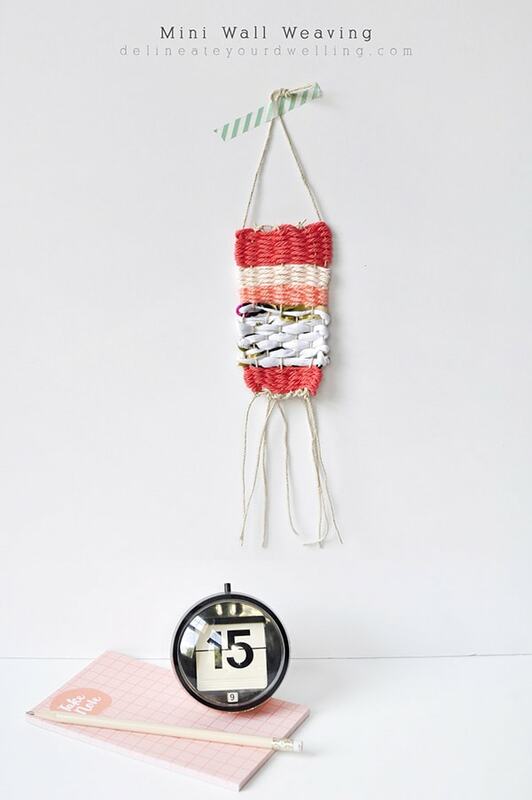 So today, I am proud to share my solution to those fears, my MINI Wall Weaving! The size of cardboard piece you select will determine the overall size of your wall weaving. So, I cut mine down to roughly 4.5″ wide and 7″ in length. Using your ruler, measure and mark 3/4″ on either side. Then, mark every 1/2″ between your first two marks. Using scissors, cut along each of your marks – on both ends of your cardboard. This is creating the grooves for your twine and essentially your loom. 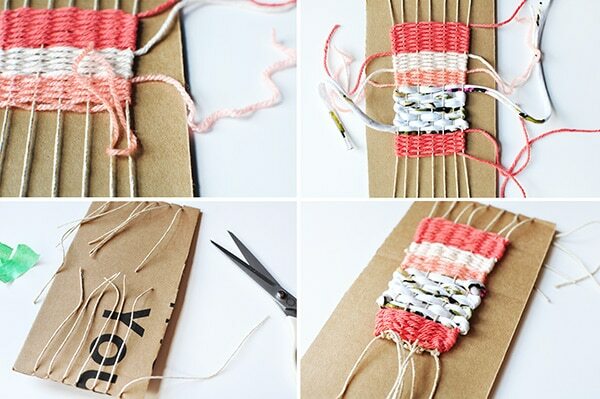 Tape twine to one side of the cardboard and then wrap around the loom, until you reach the last groove. Tape down the other end and you are ready to start! Note: I did not have a weaving needle, so I just cut a coffee stir in half and taped my yarn to the end of it. It worked perfectly! DIY at it’s finest. Cut a piece of yarn about a foot long and guide your yarn/needle through your loom using an over/under type pattern. When you get to the end of the loom, simply pull your yarn taught and weaving your yarn back using the same over/under pattern. Be sure to gently pull, but not too tight or it will create a misshaped weaving. Once you have completed as many lines of yarn as you would like, cut your yarn off around 5″ past the loom. You will tie up all the loose ends at the end. I used three fairly similar yarns in thickness and then used a much thicker, tee-shirt yarn. Adding different yarn weights creates more interest to your weaving. After your weaving is completed, it’s time to finish the edges. 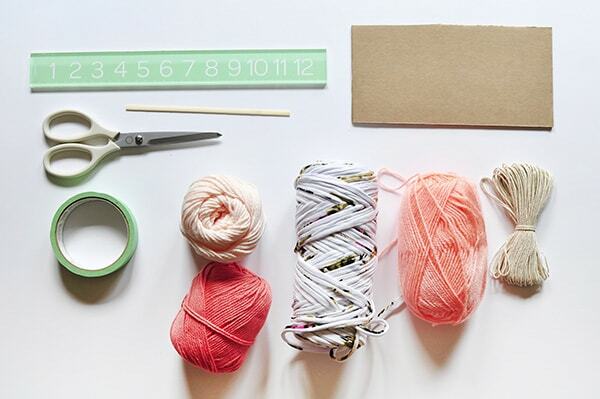 Start by taping your yarn tail to the coffee stir (or needle) and sewing it through the weaving. Cut off the excess. Turn your loom over and remove the two pieces of tape. 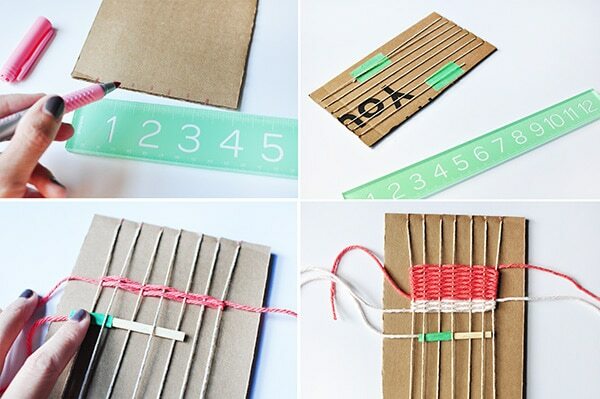 Cut the twine in the center of the cardboard and flip the loom back over. Starting on the top of your loom, tie the first and the last piece of twine together to create the piece to hang your weaving. Then, repeat with the following two pieces of twine (and so on) until you have knotted all of the twine. Repeat this knotting process on the bottom pieces, as well. I left mine quite a bit longer on the bottom for visual interest, but you can cut yours off if you prefer. 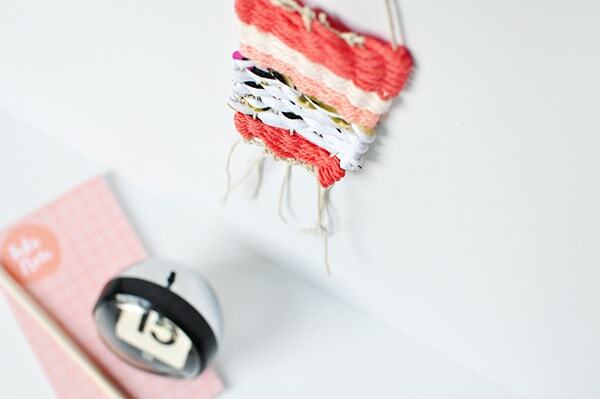 The finished product is a gorgeous and quick mini wall hanging! From start to finish, this project took me an hour. It might have taken even less had I not stopped to take pictures all along the way. I’m so so happy I finally took the risk and attempted a wall weaving. Starting with a mini sized helped me to not feel overwhelmed, too! 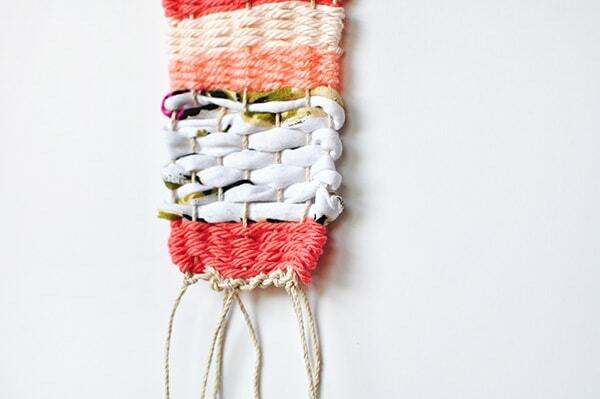 Have you done any weaving or macrame projects? 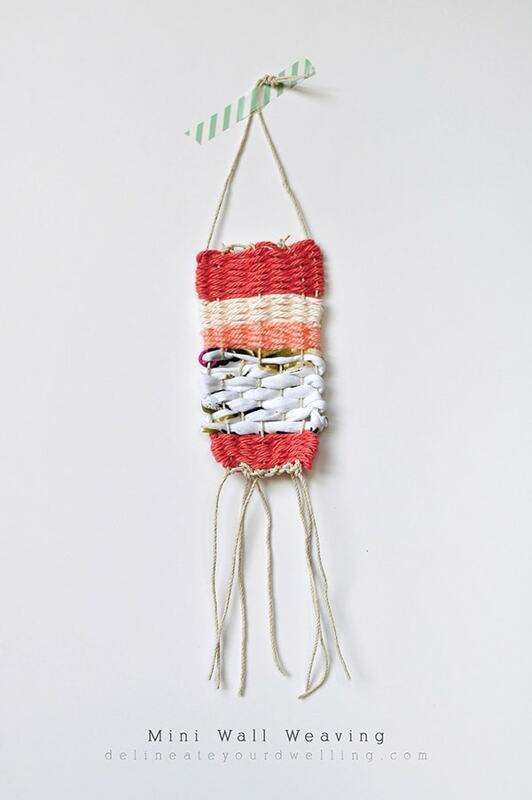 And if you REALLY want to do a weaving but aren’t quite ready to make the jump, you should check out my Wall Weaving printable! 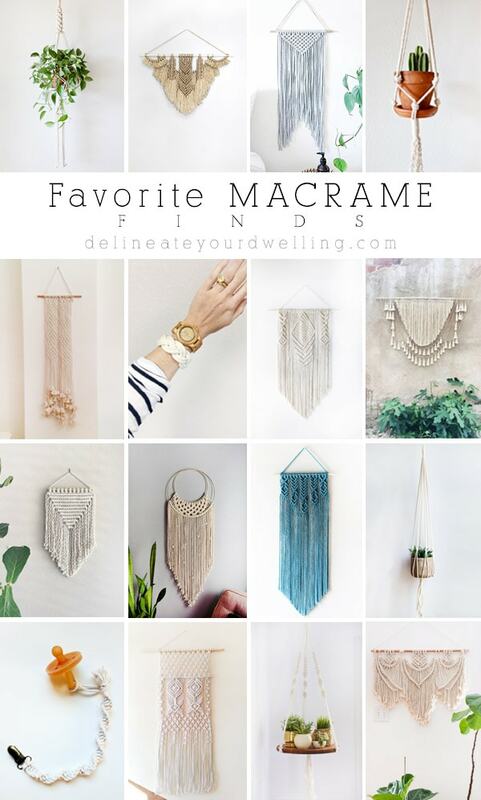 You might like my Favorite Macrame Finds post, too. I love this… those weavings have always intimidated me too, so thanks for breaking it down! Looks pretty simple and fun. Thank you, Chelsea! I definitely recommend starting with a small weaving first… it makes it so much less intimidating! I love weavings, but they always look like they’re super hard, this has demystified them and I might give one a go at the weekend – thank you! I’m so happy to hear this, Natalie! It was so much easier than I thought it would be. My suggestion is start small! Good luck.